The good people at Barbour Publishing have done it again. They have came out with a new juvenile fiction book written by Annie Tipton. The name of this book is Diary of a Real Payne Book 1: True Story. Barbour Publishing is a publisher with a niche in Christian book publishing. They proudly publish more than 150 books a year. They were very excited to reach their 14 million publishing mark! 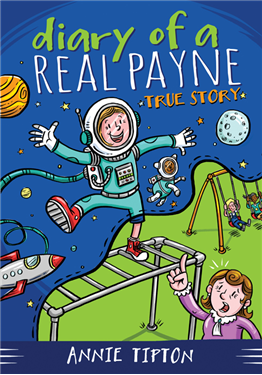 Diary of a Real Payne Book 1: True Story is a 192 page paperback book that is aimed to children ages 8-12. The book is about a girl name Emma Jean Payne (known as EJ). She is a ten year old girl that has a BIG imagination. EJ is spunky and often miss-understood by those around her. She lives in a boring small town and Her father is a pastor and her mother is a 2nd grade teacher. EJ’s imagination was so big it would often times get her into situations, like the time she imagined she was a race car driver while in the grocery store with the shopping cart. (oops.) Along with many other imaginations and antics happening all throughout the book. Each chapter begins with a diary entry that gives you the preface as to what will happen in the upcoming chapter. The chapter then tells the story of what becomes of her wild imagination. This book takes you through the holiday season and has some good lessons, like service, loving thy neighbor and doing things because they are the right thing to do. This book sales for $5.99 directly from the Barbour Publishing. At the time of posting it is on sale for $4.49. Book 2, Church Camp Chaos comes out in March 2014. I decided to let my older two read this on their own. I spent some special time at bedtime with my younger two (ages 8 and 4) reading this book aloud to them. We each had our laughs and some of us had tears too. Clean fun engaging books are getting harder and harder to find. This one hits all the marks. It is a good clean read with a good moral to the story about how God has big plans for your life- bigger than you can imagine. While not being a “perfect model” Christian family (I’m not sure there even is such a thing) Many Christian character traits are shown in EJ’s family throughout this entire book. It is a fun book. It will literally make you laugh out loud. It keeps you entertained in a fun way. It is engaging as it has someone that most people can relate to. From a young girl with big imagination and big dreams. An annoying little brother. A dad with a sense of humor and a mom with some well….. hair. My family is not the only one who got to review this. See what others think by checking out this post.